Bacchus and owner Jennifer Boyce explore the Grand Prix ring at Thermal. 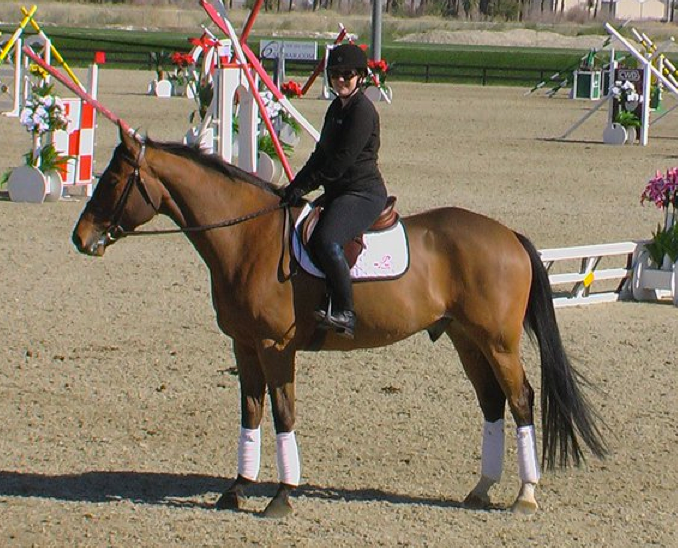 Owner Jennifer Boyce tells us that her Quailhurst-bred gelding Bacchus (Caletino x Tiaraella) was a superstar on his first out of state trip to the 2011 HITS Thermal winter circuit shows. A coming five year-old, Bacchus competed in the baby green divisions with trainer Karianne Boyce Lockhart of Poseidon Stables and with owner Jennifer in the under saddle classes, receiving ribbons in every class entered. Both Jennifer and Karianne take a wonderful approach to supporting the learning of this young horse and made Bacchus’ first winter circuit a positive experience beyond the ribbons. Jennifer sent us lots of video from the show, including Bacchus walking right up to a spooky fence in the schooling area, showing a more seasoned but nervous horse that everything was “OK.” We’ve put together a short clip of Bacchus at Thermal below.